Trans visibility in media is, by all accounts -- more prominent than ever. Caitlyn and Laverne are household names. Yet despite these groundbreaking strides, the past couple of weeks demonstrate how far we have to go: on Monday, South Dakota passed some of the most regressive policy we've ever seen, last Friday, a trans woman was brutally murdered in Texas, and over the weekend, Breitbart News, grossly mis-gendered supermodel Andreja Pejic. In South Dakota, a highly discriminatory policy preventing transgender people, specifically students, to go to the bathroom aligned with their gender identity has recently passed the House and Senate. House Bill 1008 is one signature away from making it illegal for schools to provide trans students with accommodations subsequent with their gender identity. 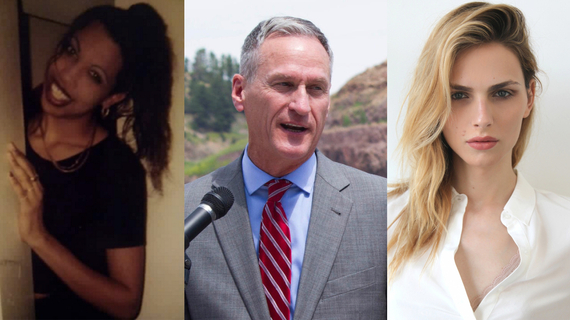 As of mid-week, the decision falls on South Dakota Governor Dennis Daugaard, who met with trans community members yesterday to hear why this bill limits their personal freedoms. When we restrict liberties and advance inequalities, we fail to prosper as a country. Studies show that trans youth forced to function under restrictions like those provided in HB 1008 are more likely to drop out of school, skip class, suffer from depression and attempt suicide. To lend your support, tell Governor Dennis Daugaard to veto HB 1008. Click HERE. In January, Monica Loera was shot at her home in Austin, becoming the first known murder of a transgender person in 2016. Last Friday, Veronica Cano, a transgender woman from Pleasanton, Texas was found dead in a motel bathroom, fully clothed. Violence against trans women of color is not a new problem; last year, there were 21 known murders of trans people in the United States. A GoFundMe page has started to help alleviate the cost of Veronica's funeral expenses. Please consider donating to help her family cope with this sudden loss. Last Friday, Brietbart News reporter Kipp Jones blatantly failed to meet widely accepted reporting standards (set forth by GLAAD) when it comes to covering the transgender community. In a piece about Andreja Pejic's new Marie Claire cover, Jones states: "...the 24-year-old underwent gender reassignment surgery in 2014, and he has been modeling as a female ever since." He doesn't stop there, referring to Andreja as 'he' at least three more times. This misuse of pronouns and denial of one's gender identity in the media reinforces the continued demeaning and discrimination of and against the trans community. As a community, it is our responsibility to hold members of the media accountable for such public and blatant acts of ignorance. Click HERE to email Kipp Jones, and ask him to issue a correction. We believe visibility in the media is one of the many antidotes to violence and injustice, and mainstream media has the power to elevate the stories of marginalized groups, and give us a platform to share our story. Alas, we've got to hold all sectors of society responsible, if equal justice is to advance. There is a long battle for trans rights ahead. We must continue to tell our stories, speak our truth and serve our community to the best of our ability.